During the Hirnantian glacial event, a 1-2 million year event at the end of the Ordovician period which extended from 490-433 million years ago, ice built up over the primitive continent of Gondwana. 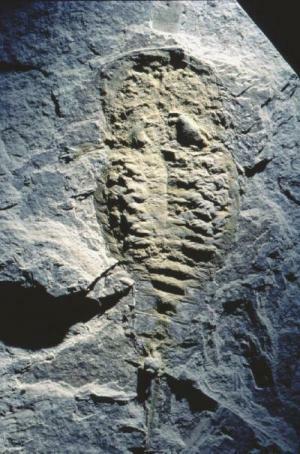 his was a period of diverse marine invertebrates and early vertebrates. The ice sheet collapsed rapidly at the end of this time, producing a variety of glacial deposits,topped by the Soom Shale, a 10-15 m-thick black shale. The demise of the marine communities at the end of the Ordovician is widely viewed as the second most devastating extinction to marine life in the history of the earth, and the third largest of the five major extinctions. T Sarah Gabbott and colleagues analyzed thin sections of the shale and found that it contains coarse silt and fine sand in discrete layers (laminae) that are associated with organic material derived from plankton. They concluded that the geologic setting resembled that found today on the McMurdo Ice Shelf in the Antarctic. Dust, carried by fierce glacial winds, blew off the ice shelf and into the sea where it fell through the water column. It carried nutrients that stimulated the production of phytoplankton, which sank to the bottom. In a press release, Gabbott speculated that not only did the nutrients fuel life, they preserved it well when the rotting carcusses sank into the cold, stagnant depths. "A cold wind, here, was key to both life and death." A few terms: plankton are the organisms that drift in the oceans, seas or bodies of fresh water. There are three primary groups, defined according to their function: phytoplankton that use light for photosynthesis (a "producer"); zooplankton that feed on the phytoplankton (a "consumer"); and bacterioplankton (a "recycler"), which basically recycle the other two types of plankton. On November 19, 1 man was killed and 27 miners are missing due to an explosion in the Pike River coal mine on the south island of New Zealand. The mine has been under development since the 1970's, and is excavating from the largest hard-coking coal deposit in New Zealand. It is in an environmentally sensitive area, and has been lauded as an exemplary development in a sensitive area. The tunnel, seen at the left, goes nearly 2.5 km nearly horizontally into the mountain. 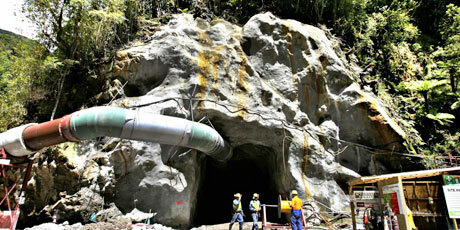 The trapped miners may only be a few hundred feet underground. Dangers in coal mines arise from at least three factors: the presence of both methane and carbon dioxide gases, and coal dust. In this particular area of New Zealand, active faults produce a seismic risk as well. Other causes of accidents are rock bursts, collapse of natural or artificial pillars, flooding, malfunctioning of equipment, and improper use of explosives in the mining process. Methane gas is nasty stuff: an asphyxiant, flammable and potentially explosive. The combustion of methane, CH4, is exothermic. When combined with two O2 molecules, it decomposes to form CO2 (gas) and 2 H2O (liquid) molecules, releasing 891 kJ of energy. It is both flammable and explosive. 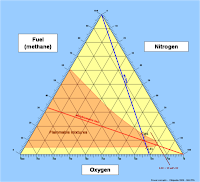 When mixed with oxygen and nitrogen in air in certain mixtures (orange region on the ternary diagram to the right), it will explode. The blue line represents air. If there is less than about 5% methane in the mixture it is too lean to explode (the LEL point on the diagram), and if there is more than about 15%, it is too rich to explode (the UEL point). The process of mining coal generates an enormous amount of coal dust. When high concentrations of this are suspended in air, and there is even a small ignition source, the nearly instantaneous reaction of the fine coal particles with oxygen can produce an explosion. The ignition source does not need to be a flame; it can be an electrostatic discharge, friction, or sparks from machinery. Dust explosions are not restricted to coal mines, but have occurred around grain silos, flour mills, and metal works (aluminum, titanium). They are intentionally part of thermobaric weapons; see my older post here. Degassing of Comet Hartley 2--Geysers causing a cosmic snow storm! Images from the HIgh-Resolution Imager on NASA's EPOXI spacecraft. In this amazing image released this week by NASA's EPOXI mission, two different dynamic processes are shown. The tiny (~0.93 mile length) peanut-shaped object is Comet Hartley 2. (It's actually being described as more like a drumstick with knobby ends than a peanut.) 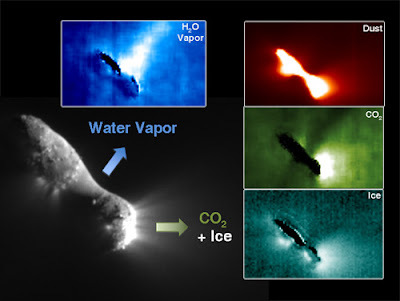 The images, in different infrared wavelengths, show the distribution of water vapor, dust, CO2, and ice crystals around the comet. The NASA press releases emphasize that the difference between the smooth and rough areas on this comet are associated with the a difference in the erupting gas: water vapor from the smooth central section, and CO2 from the jagged ends of the peanut. From press articles, it appears that Hartley 2 is producing about 200 tons per second of water vapor; the flux of CO2 has not been estimated as far as I can tell. The H2O vapor production rate is comparable to the rate estimated for production by the plumes at the south pole of Enceladus, an active satellite of Saturn. 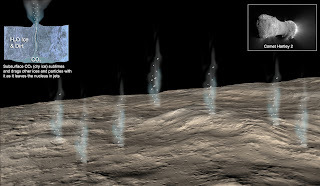 Artist's conception of degassing on Comet Hartley 2. An analysis of the dynamics of the jets as geysers erupting into a vacuum can be found in Yelle, R.V., Soderblom, L.A., and Jokippi, J.R., Formation of jets in Comet 19P/Borrelly by subsurface geysers, Icarus, 167, 30-35, 2004. Their proposal is that there are cavities in the subsurface of the comet that have nozzle-like outlets to the vacuum of space. As gas flows from a cavity through a narrow nozzle, the flow becomes collimated, and focused jets such as those observed in these images are produced. Dust is entrained in the gas flow and is accelerated out into a fairly linear jet. When the gas leaves the cavity, it expands laterally because of the high overpressures compared to the vacuum of space, but the density drops so rapidly that the dust grains that it has been carrying continue on their collimated trajectories, decoupled from the gas. The result is a diffuse gas cloud with collimated beams of dust or ice. This appears to be the first time that it's been shown that sublimation of subsurface carbon dioxide drives the outgassing of a comet's nucleus. Other articles of interest: Emily Lakdawalla writes The Planetary Society Blog and has a nice essay describing the features on the comet. Football can be dangerous...in more ways than expected! A shelf cloud. Photographer: Jake Deremer. A wonderful source of potential topics and images for this blog is Earth Science Picture of the Day at http://epod.usra.edu, which is where I found this great photo today. 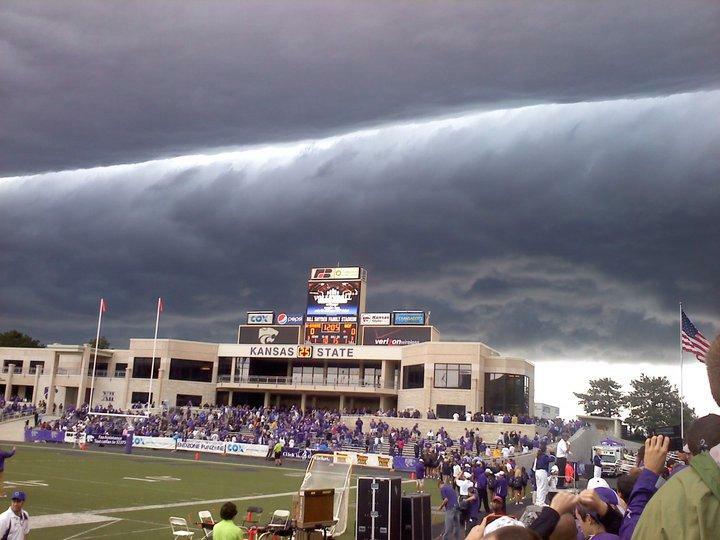 This photo was taken at a football game between Kansas State University and the University of Central Florida on September 25, 2010 and, as far as I can tell, even though it looks somewhat like a watercolor painting, it has not been Photoshop'd! Due to the danger of lightning and damaging winds, the football game was suspended for about 90 minutes. This cloud formation is a so-called "shelf cloud", a not uncommon cloud in the midwest. Google it and you get a stunning array of images! It is a type of "arcus cloud", a low, horizontal cloud formation. There are two types of arcus clouds, one associated with outflows of cold air from cold fronts and the other specifically associated with thunderstorms. The type of cloud shown here is associated with thunderstorms. 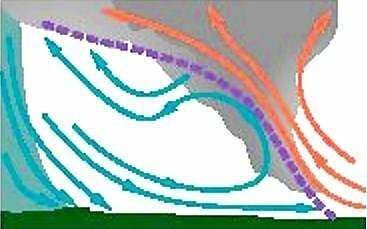 The cartoon to the right shows the dynamics leading to the formation of the shelf cloud. Cold air, descending from a thunderstorm on the left, sweeps out along the ground (blue arrows), displacing warm humid air toward the right. The warm air rises and droplets of moisture nucleate to form the cloud. 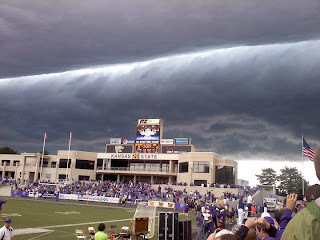 It was named a shelf cloud because of the "uniform flatness of the cloud base region where moist air that usually originates from the lowest part of the boundary layer achieves homogeneous condensation (discussed in Fankhauser, et al., Bull. Amer. Meteoritical Soc., 64(5), 450-462, 1983)." In this photo you can see up under and behind the roll cloud. Note that the shelf cloud is "connected" to the thunderstorm cloud driving the system. A bit of practical advice: A shelf cloud precedes a storm. It is generally associated with a squall line, and marks the place where strong winds begin. Take note and take shelter! 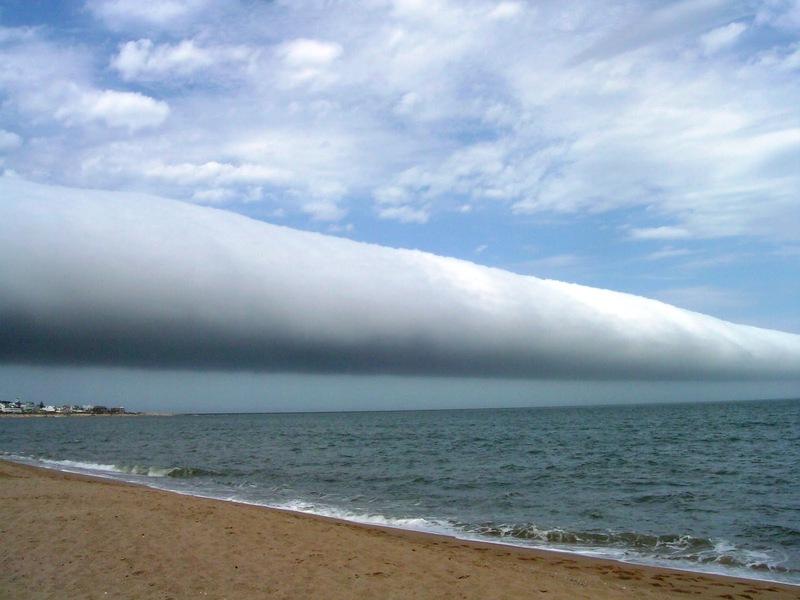 The second type of arcus cloud is a "roll cloud". These form when cold air from an advancing cold front advances under a warmer humid layer, typically over relatively long distances. The humid air roles up around a horizontal axis. These waves are a form of soliton, having a single peak and maintaining the shape as they advance. Unlike shelf clouds, the roll clouds are not connected to another set of clouds. Note the clear air behind the cloud (to the left). 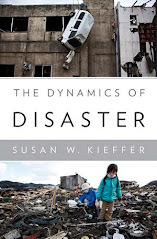 Why does a geologist care about the Sudan and John Kerry? Sudan is an impoverished nation south of Egypt. The Nile river divides the country into east and west, religious agendas divide the north from the south. Northern Sudan is dominated by an Islamic government and the Arabic language. The south is dominated by Christians and anamists. Civil wars between Northern and Southern Sudan began in 1955, the year before independence from Anglo-Egyptian rule that had been in place since 1899. These were fueled by complicated historical events, and fears by the southerners that the north would dominate them after independence. Conflict raged from 1955 to 1972, followed by a 10-year haitus, but civil war broke out again from 1983. Since 1983, civil war and famine have claimed the lives of nearly 2 million people. From 1989 to 2005, war continued, terminating with the Nairobi Comprehensive Peace Agreement that granted Southern Sudan autonomy for six years, to be followed by a referendum about independence. This brings us to the present. Voter registration begins today (November 15, 2010) for the referendum vote, which is to take place on January 9, 2011.. It is being observed by representatives from the European Union. John Kerry was in Khartoum on November 7 to carry the message from Obama that the US is committed to peace and to the negotiations. Obama has offered proposals, and there are fairly explicit hints that lifting sanctions on Sudan is on the table. Why does a geologist care? Oil and water. 70% of the oil in Sudan lies in the south, but land locked southern Sudan has no way to get the oil to market unless it either goes through northern Sudan, or builds alternate pipelines, probably through Kenya. The north isn't sure that it can survive on 30% of the oil revenues. And, water--the Nile river has headwaters in the south. Transboundary water issues may become increasingly frequent in the 21st century as it becomes the so-called "new oil." Tension is present between the US and Mexico because of the trans-boundary Colorado River, and Bangladesh has over 50 rivers that begin in India or Myanmar. 17 countries share the Danube, 11 share the Congo and Niger, 10 share the Nile, 9 share the Rhine and Zambezi, 8 share the Amazon and Lake Chad, and 6 share the Aral Sea, the Tigris and Euphrates, and the Volta. These and other data are available here. glancing blow to Earth's magnetic field sometime on Nov. 14th or 15th." 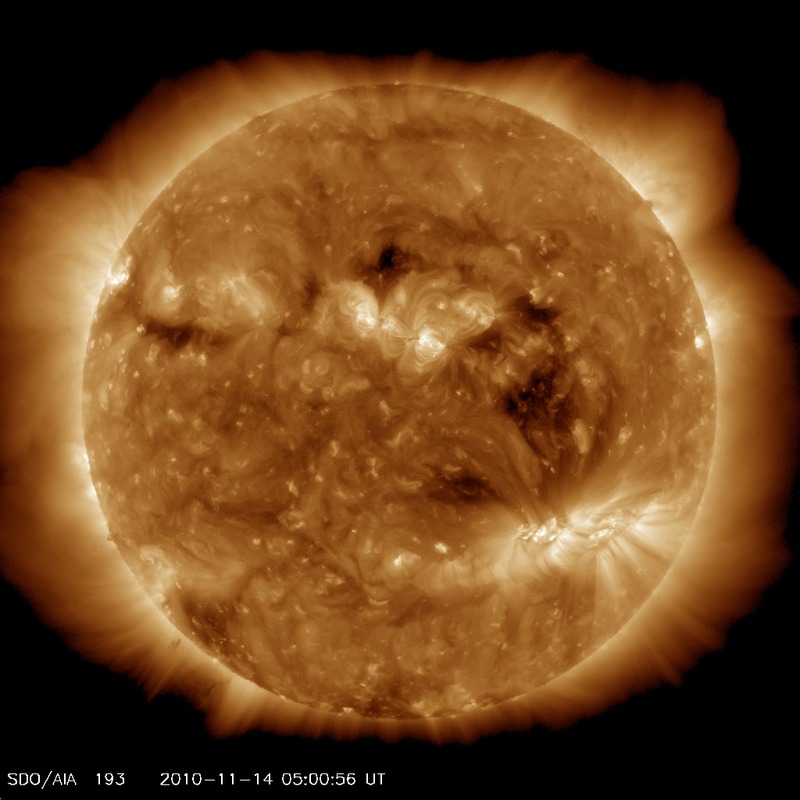 Photo credit SDO; can be obtained here. After a sluggish start to the current active phase of the solar cycle, the sun is now developing some active sunspot groups. The sun has a high-density core at a temperature of over 13 million K extending to about 0.25 of its radius. above this, extending to about 0.7 solar radius is a so-called radiative zone where heat is transported by radiation. This is surrounded by an outer layer heat is transported by convection of hot material to the surface. The visible surface of the sun is called the photosphere. Sunspots are regions of strong magnetic activity which reduces convection of energy from the interior to the surface. As a result, they are cooler than other areas of the sun--a mere 3000-4500 K in contrast to the surrounding material at about 5,780 K. The magnetic field causes strong heating in the corona--the extended atmosphere of the sun. These active regions are the source of solar flares and "coronal mass ejections" (CME's), emissions of matter, magnetic fields and electromagnetic radiation. It is believed that the ejections are caused by magnetic reconnection--the rearrangement of magnetic lines of force when two oppositely directed magnteic fields are brought into proximity. The rearrangement releases energy that was stored in the original oppositely directed fields. The movie at the bottom shows a spectacular coronal mass ejection on October 1, 2001. The images in the movie were taken by SOHO's (Solar Orbiting Heliospheric Observatory) LASCO (Large Angle and Spectrometric Coronograph) instrument. There is a Science Daily article on coronal mass ejections here and an interesting article speculating on the effects of charged particles either from a CME or from a nuclear burst on our infrastructures here. Former House speaker Newt Gingrich, a likely presidential contender, views this as an enormous threat, and it will be interesting to see if he makes it an issue if he campaigns! 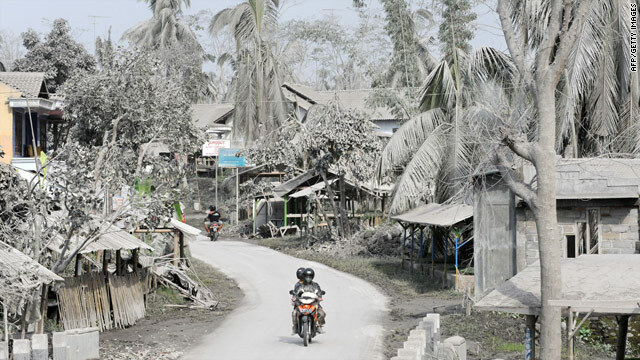 According to some reports, the death toll from the on-going Merapi eruptions has exceeded 200, and nearly 400,000 people have been displaced from their homes and villages. President Obama visited Indonesia earlier this week, but cut his visit short be several hours so that his plane would not be caught by changing winds. To date, the eruptions have released about 140 million cubic meters, exceeding the 100 million cubic meters estimated to have erupted in 1872. In a paper in press for Geophysical Research Letters (now online), Anchukaitis et al. have examined the influence of volcanic eruptions on climate, and arrive at conclusions that challenge the major results from the Global Circulation Models currently used to model climate. Those models predict that large volcanic eruptions should result in unusually dry conditions through the regions of Asia that experience monsoons. Anchukaitis et al. used two long tree ring-based proxy's to reconstruct moisture patterns. The first was a tree-ring chronology from a long-lived ccypress species in southern Vietnam, and the second is the "Monsoon Asia Drough Atlas", which also includes tree-ring proxies. These reconstructed conditions indicate that the response to volcanic eruptions is an anomalously wet southeast Asia and dry conditions over central Asia, a conclusion that is the exact opposite of effects predicted by three widely used climate models: CSM1.4, CCSM3, and GISS ModelE. The authors also conclude that strong El Nino and La Nina weather conditions could be important. Anchukaitis concludes "...that some GCMs do not correctly capture the balance of important coupled ocean-atmosphere processes involved in the response of Asian climate to radiative forcing. In a press release accompanying the article the authors also caution that the study suggests that proposed geoengineering schemes to counteract manmade climate change with huge artificial release of sulphates similar to those emitted by volcanoes might have complex unintended consequences. As of this time, volcanologists do not think that the eruption at Merapi is big enough, or sulfurous enough, to affect the climate. 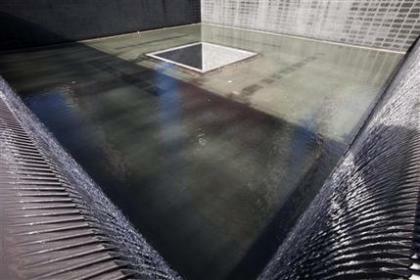 A quick note to the fluid dynamicists: here's a BBC news article and video of a waterfall project being tested at Ground Zero in NYZ. I don't know any of the details, but there's some good footage of waterfalls on that site. It appears that testing of the waterfalls if just beginning, and so there should be more news soon. Where did the groundwater in the Pacific Northwest come from? Toward the end of the last ice ages, approximately 20,000 years ago, ice plugged several of the rivers that normally drained water from the area we now know as Montana. Behind the ice dams, a gigantic lake, Lake Missoula formed. Repeatedly, the ice dams broke and catastrophic flood, with discharges on the order of a million cubic meters per second, raced down old and new channels, flooding parts of Idaho, Washington, and Oregon under hundreds of feet of water in just a few days. In a new paper, Brown et al. 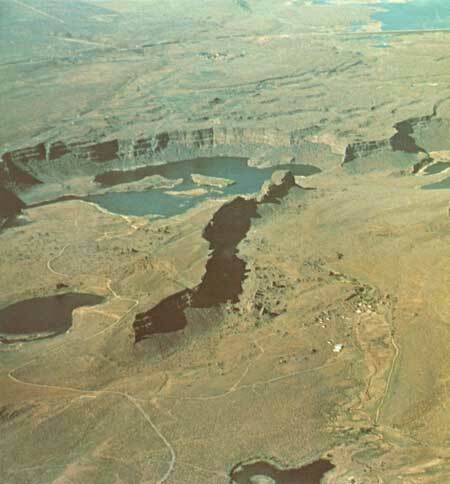 propose that these floods, in spite of their brevity, provided the groundwater that is now present within the aquifers of the Columbia River Basalts that cover the region (Brown, K.B., et al., Isotopically-depleted late Pleistocene groundwater in Columbia River Basalt aquifers: Evidence for recharge of glacial Lake Missoula floodwaters, Geophysical Research Letters, vol. 37, L21402, 5 pp, 2010.). This region is semi-arid today, and general climate models suggest that it was colder and drier during the Last Glacial Maximum. The groundwaters have anomalously low del O18 and delD values, and radiocarbon ages between 15.7 and 19.6 thousand years before present, and the authors suggest that they were recharged from multiple pulses of the Missoula flood events. Several groundwaters have even older radiocarbon ages and may have come from earlier undocumented Missoula flood events. The mechanism by which aquifers could be charged with such huge volumes of water in times of just a few days, even with repeated episodes, are unknown, but the large depth (366 m) and volume (>1200 cubic kilometers) of the ponds formed during the floods may have helped drive the water into the aquifers. These waters are important for agricultural and domestic water resources in central Washington, and--like the Great Lakes--may not be replenished under current geological conditions. the Photo of the Day on Nov. 8, 2010. Icy stalactites are basically icicles! They have some characteristics in common with the better-known rocky stalactites and stalagmites formed out of CaCO3 when water rich in this compound flows into open spaces or caves. 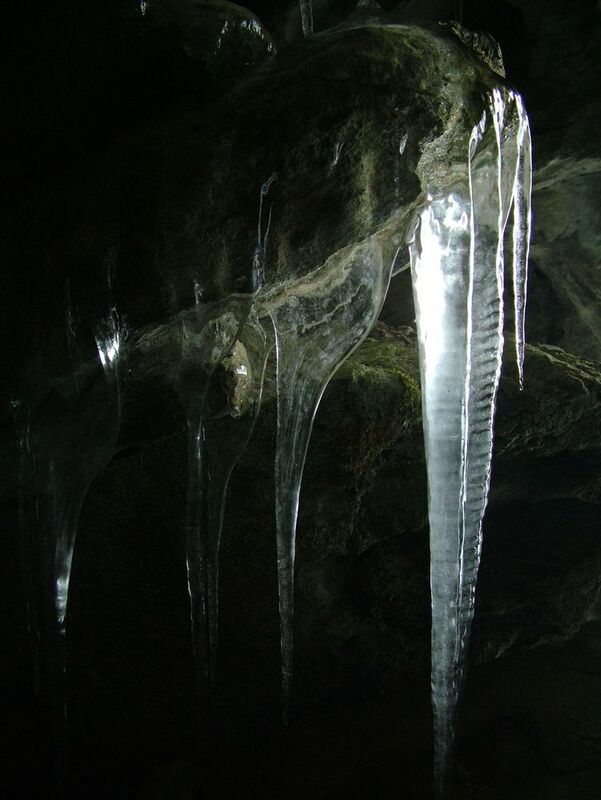 Examples of this kind of stalactite are found in the Mammouth Caves, Kentucky. Icy stalactites have been observed beneath sea ice, e.g., in the McMurdo Sound area of the Antarctic. The bottom of a sea ice sheet has numerous "disconnected ice platelets protruding downward" (R.A. Paige, Stalactite growth beneath sea ice, Science, v. 167, pp. 171-172, 1970). This is called the "skeleton layer", and ranges in thickness from a few centimeters up to 60 cm. Part of this layer consists of freshwater stalactites. These can extend up to a meter or more below the skeleton layer. The process by which briny water forms freshwater stalactites is fairly complicated (see discussion in the Paige article above). Two effects operate to produce the rippled texture of icicles. Latent heat is more efficiently transferred out of the system on the convex protrusions than from the convex indentations, which tends to make the protrusions grow faster than the indentations. This is the so-called "Laplace instability". It is countered by heat transfer down the icicle by the flowing water. Operating together, they produce a remarkable constant ripple spacing of about 1 cm, although the amplitude of the ripples can vary from one icicle to another. Morris asked: Do the ripples move? One group of researchers (Ogawa and Furukawa, Physical Review E, October 2002) that developed a physical model for the ripple development predicted that the ripples should migrate down an icicle at about half the speed that the icicle grows. Another author (Ueno, Phys. Rev. E69 (5) 2004) predicted that the ripples would move up. Morris was able to use edge detection methods on videos of the icicle development to show that the ripples moved upward very slightly. Mount Merapi and "ash hurricanes"
as well as a hot spot on the central dome. Image taken on November 1. Since the eruption of Mount Merapi started on October 26, 2010,at least 156 people have died (reports are not consistent at this time). Press reports have told of people dying from burns and ash suffocation, but no evidence had surfaced regarding the cause of the burns and suffocation because bad weather had prohibited direct observation of the volcano. 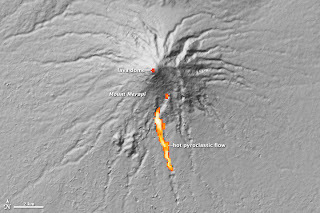 Now, the ASTER instrument on NASA's Terra satellite has documented that hot pyroclastic flows ("ash hurricanes") have been sweeping down the flanks of the volcano. (A video of pyroclastic flows on Merapi from previous eruptions can be found here by scrolling down the post to the video.) Temperatures of 450-600 degrees Celsius (842-1112 Fahrenheit have been reported by the Indonesian Volcanology Technology Development and Assessment Agency. I have found a good blog on the Merapi eruption by Erik Klemetti here. What drives pyroclastic flows? In the early frames of the video, large boulders can be seen bouncing down the hill side-by-side with the pyroclastic flow. This indicates that the flow, like the bouncing boulders, is being driven downhill by gravitational forces. When gravity is the main driving force, hot material generally is confined to a valley--it's running downhill. It can "run up" and over hills because of momentum--just like a car that loses its brakes at the top of a hill may race downhill and up the other side of a valley--but generally flows given by gravity follow the terrain. In later frames of this video, including a spectacular segment taken at night, you can see that the pyroclastic flows are being generated by collapse of individual pieces of the steep lava dome. Section after section is peeling off and falling down and, as the sections impact the ground or other collapsing pieces, they fragment to release fragments and gasses that combine to give form the pyroclastic flow itself. You do not see "blowouts" of gas-rich material in this video. A more dangerous condition may arise if pressurized gases inside the collapsing dome decompress rapidly, forming blowouts. Jon Fink and I considered some of these conditions in a paper in Nature, vol. 363, pp. 612-615, 1993. This paper was motivated by the fact that a pyroclastic flow on Mount Unzen on June 3, 1991, killed three volcanologists who were on high ground that had escaped damage from pyroclastic flows earlier in the eruption. What happened? We speculated that a section of the dome containing slightly more volatiles than earlier collapsed sections produced a pyroclastic flow that had higher velocities than had been produced in earlier volatile-poor eruptions. We concluded that velocity excesses of over 100 m/sec could be caused by decompression of gases in such a section. 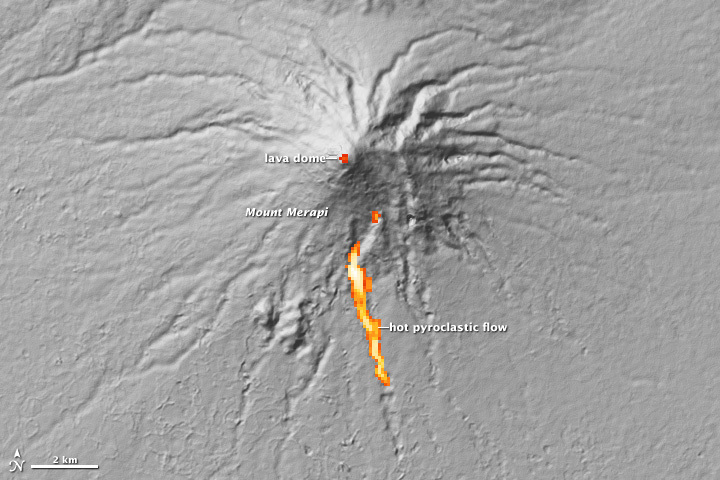 These flows would not be confined to valleys, such as the flows to date appear to have been at Merapi, but can have broader extent and longer runout distances. The lateral blast at Mount St.Helens was such a blast. In spite of the inconveniences and economic consequences, it is necessary to evacuate people from areas around the volcanic summit that appear safe based on the trajectories of small, gravity-driven pyroclastic flows, but that may be devastated by more gas-rich eruptions. Reportedly, about 200,000 people have been displaced by the current eruption.